ABOVE: A video tour inside a room at the Biltmore Hotel. Watch more hotel videos. This page allows you to watch a video find directions, post a comment, read reviews, and check rates at the Catalina Hotel. Rates: Low season from $159. High season from $199. 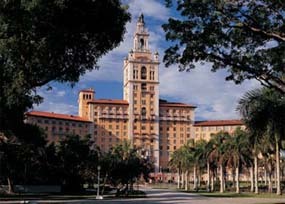 The Biltmore Hotel sits on 25 acres and was declared a national historic landmark in l996. The craftsmanship and detail found throughout The Biltmore is reminiscent of an Old World European luxury hotel. The hotel offers 76,000 square feet of meeting facilities, a championship 18-hole golf course, tennis facilities, spa, fitness center, and the largest hotel swimming pool in the - USA. High speed Internet access is available in the guest rooms. • Take LeJeune South to Anastasia. • Go Right on Anastasia past one light and 2 stop signs. • The Biltmore is on the Left after the 2nd stop sign. 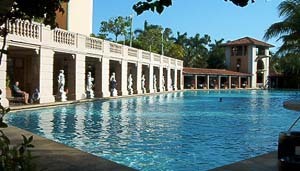 Biltmore is located at 1144 Anastasia Ave., Coral Gables, FL 33134. Use our Miami hotel map to find the exact location.